Our clients purchased the original 1959 ‘ex-govie’ property in Ainslie and it was a case of buying the worst house in the best street scenario. They could see the potential of the property, a solid home within close proximity to the city and set about researching and considering what to do with the property as it was in dire need of some love and attention. Whilst most would consider the home a knock down, our clients lived in the home and considered all the possibilities the home could become. Their seed ideas soon turned into reality and they proceeded down the extension and renovation path. Our clients were introduced to Build Professional through houzz and progressed through our design and build process. The original 3 bedroom, 1 bathroom home was extremely run down and a complete overhaul and remodel was required. During the design consultation we listened to their ideas and suggestions. Our clients were intent on creating a home that encapsulates what a modern family is looking for in a home in 2017 and what a city dwelling, urban existing person values the most? Together we worked through these concepts with a desired budget in mind and set about delivering the well thought vision for our client’s home in Ainslie. The discussions were based around the demand for two separate living spaces, open plan kitchen and dining, large master with en-suite, study and an abundance of storage. After living in the dark, wood- clad confined spaces of the original home, the extension and remodel required creating a feeling of open, light and airy spaces with all the living areas desiring a connection to the outdoors inviting greenery into the home as well as providing a charming and safe place for children to play in the backyard. The design solution that the Build Professional team established for the home was to maintain the original façade, whilst focussing on renovating and rebuilding at the back of the house. 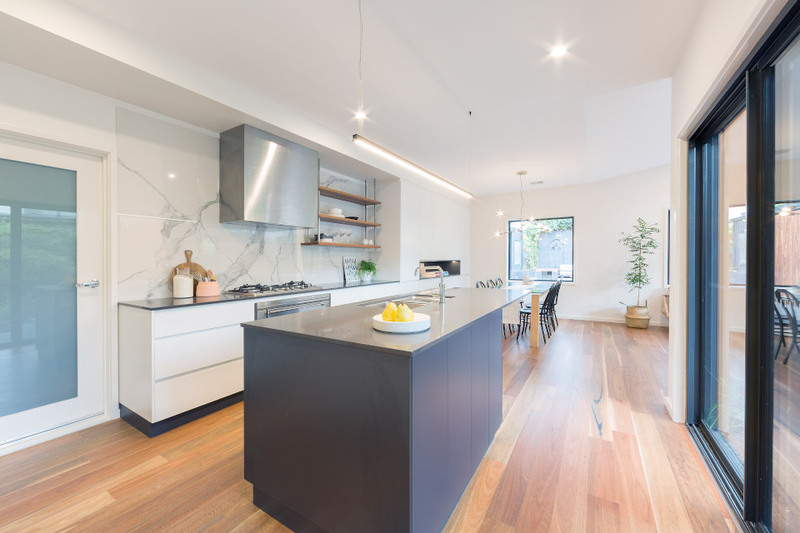 The design involved remodelling the existing layout of the home, all rooms except for two bedrooms and a bathroom was completely remodelled to achieve a superior floor plan with much improved flow and function. An extension to the back of the home as well as building in the existing front porch completed the desired plan for this home extension and renovation project. The completed home would present with two zones: the front containing the generous entry, study nook, plentiful storage, four bedrooms, the master with en-suite, main bathroom and a living room. This zone flows beautifully into the garden wing featuring the kitchen, dining, family room and laundry. The remodelled home would improve and meet the lifestyle demands of modern families of all ages as well as future proofing the home with separate living spaces for the family to live and enjoy. The real beauty of this home is the design approach to integrate indoor/outdoor living, with the lounge, kitchen, dining, family and study all positioned to take advantage of the landscaped gardens. The new picture windows, opening windows and sliding doors have all been located thoughtfully to capture the northern aspect and to provide the anticipated connection to the backyard. A beautiful design feature of the home is the family room extension boasting a soaring ceiling and highlight window with the inclusion of a modern take on a skillion roof and the addition of the stunning western red cedar cladding to the exterior of the extension creating design interest to the home and a gorgeous backdrop to the greenery of the garden. So much emphasis of the design was based around modern living and this is evident in the creation of the chef’s kitchen with the inclusion of three smeg steam and multi-function ovens, stone benchtops, full wall marble style splashback and soft closing drawers. The budget was utilised towards things that the modern family would value like the kitchen and the smart door with keyless entry, new double glazed windows as well as unseen things; the home is fully rewired with the addition of a new hot water system and a new heating system. An indicator of the approach of the innovation was to simply not just present as a renovation ‘flip’, but as the outcome of a thoughtful redesign where no expense was spared. Whilst the home’s freshly painted street presence remains similar to the original neighbouring Ainslie homes, once you step inside the home you are transported straight into the 21st century. However, to hold onto a part of the character of the old home, the original front windows and the original fireplace have been kept as a reminder of the home’s history. The planning involved in this project to design a construction schedule in our discussions and process for our clients was imperative as our clients and their 4 cats lived through almost the entire process, through the depths of winter and one of Canberra’s wettest winters on record! And we had to maintain access for the cats throughout the entire construction period. The original home was a typical example of a series of poor decisions, workmanship or DIY that we have seen or experienced. The Build Professional team went on and undertook a lot of demolition to take this home back to its shell and start again. We removed the asbestos cladding to the back extension including the roof and only leaving the garage wall standing. This enabled our carpenters to replace the old flat leaking roof and incorporate roof trusses and engineered timber beams to create “the hood” to our new cedar clad living room. No more roof leaks! Opening up the old kitchen and laundry enabled the home a new sense of freedom by de-cluttering the rabbit warren access and removing the timber lining boards. This was accomplished by one main structural beam and a series of transferred loading points. The skylight is the only remaining feature of the existing kitchen and that too needed re-lining and insulating to create the effect it was originally meant for. Some of the windows were re-used and remain in place to the bedrooms as a reminder of the past and an eclectic take on the future as discussed in part of the design scope. Being a responsible renovator, we recycled the roofing and roof beams to a farmer and all hardwood timber was stacked aside and taken by many different people for their own purposes. All demolished bricks and pavers were removed to the recyclers. This project was a great partnership & collaboration between our clients and the Build Professional team, working through the design and build home transformation journey was an absolute pleasure. We, along with our clients are absolutely delighted with the end result and as a team we are extremely proud of the home that we have achieved together. This home transformation is a brilliant accomplishment, a very well thought out design incorporating features of exactly what people are looking for in homes in 2017. This home was all about transforming the house into a space suited to modern living and the end result is what our client calls ‘urban luxe’: a contemporary house, with a neutral colour palette. A home that is light and relaxing to come to at the end of the day. And ‘urban luxe’ is exactly what was achieved!